The Battle of Ghaghra was fought between Emperor Zahir ud-Din Muhammad Babur and the Eastern Afghan Confederates under Sultan Mahmud Lodi and Sultanate of Bengal, Nusrat Shah. The battle was fought in 1529. The first Battle of Panipat was fought between Babur's forces and Ibrahim Lodi's troops on 21 April 1526. Ibrahim Lodi, the ruler of the Delhi Sultanate was defeated in the battle, which paved the way for beginning of the Mughal era in India. Babur became the ruler of Delhi and Agra. After the battle Sultan Mahmud Lodi, the brother of Ibrahim Lodi declared himself Sultan and continued to resist Mughal forces. Later he joined Rana Sanga of Mewar and provided 10,000 Afghan soldiers to Rana Sanga against Babur in battle of Khanwa in 1527. After the defeat of Rana Sanga in the battle, Sultan Mahmud Lodi fled eastwards and found shelter under Sultan Nusrat Shah of Bengal. Now, Sultan Mahmud Lodi established himself in Bihar and gathered a large army. At the head of this force he advanced on Banaras and proceeded beyond it as far as Chunar. 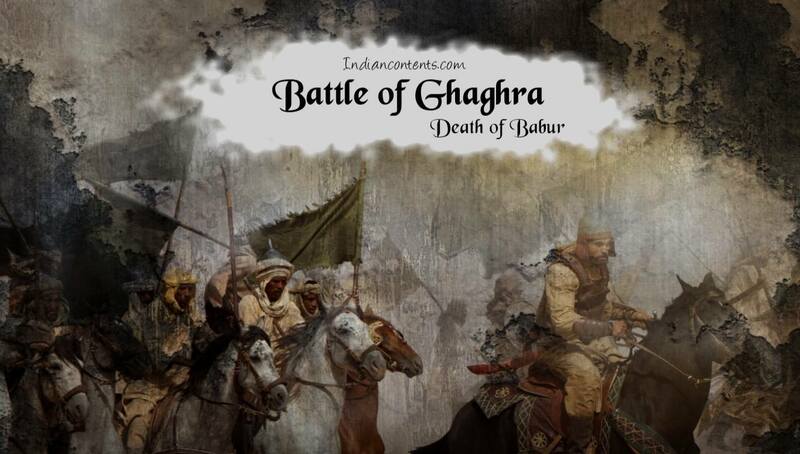 He laid siege to the fortress of Chunar, but as Babur proceeded against him and drove them into Bengal. Babur decided to put an end to the threats from Sultan Mahmud Lodi. But Babur was at peace with Sultan Nusrat Shah with whom Sultan Mahmud Lodi taken shelter. So Babur opened negotiations with Sultan Nusrat Shah, but this never created a war. Babur decided to bring them to battle, he sent an ultimatum for a passage on the confluence of the Ganga and its tributary to Sultan Nusrat Shah. But due to the negotiations of Babur in past Sultan refused for a passage. Babur declared a war against Sultan Mahmud Lodi and Sultanate of Bengal, Nusrat Shah in 1529. The forces of Emperor Babur and the Eastern Afghan Confederates under Sultan Mahmud Lodi and Sultanate of Bengal, Nusrat Shah met on the confluence of the Ganga and its tributary, the Ghagara, on 6th May, 1529. A fierce battle was fought between them. Though, boats and artillery were used by both sides the Afghans under Sultan Mahmud Lodi and Sultan Nusrat Shah were defeated. This victory was decisive in its consequences. Babur became the sovereign of Bihar, and the Afghan chiefs joined him with their troops. Now Babur got full control from the Indus to Bihar and from the Himalayas to Gwalior and Chanderi. The Sultan of Bengal Nusrat Shah accepted peace proposals of Babur. Later Babur died on December 26, 1530 at the age of 47 due to an unknown illness caused by heavy drinking and Hashish intoxication and was buried in Agra. He was succeeded by his eldest son, Humayun.